The Ho-Ho-Kus HSA Home Page will also spotlight our current fundraising programs to keep you informed! Once a month HSA volunteers serve up a variety of ice cream flavors to students. Order forms are available here until October 1, 2017. Every September, HHK T-shirts, sweatshirts and more are sold online. Every December, our school library is transformed into a festive holiday gift fair. Every May, the school grounds delight little ones and teens with cotton candy, bounce castles, rides, games, raffles, rock climbing and so much more. Ordering school supplies for the following year could not be easier or cheaper. This online fundraiser gets HHK parents organized. 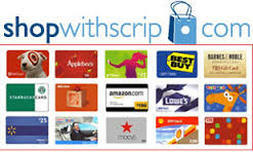 Shop with Scrip and put your shopping dollars to work! Purchase gift cards from the HSA at face value and we purchase them from Scrip at a reduced price. When you use Scrip gift cards at your favorite retailers, you're fundraising while you shop! Perfect for teacher gifts, holidays, birthdays, etc. We earned over $2,200 last year! By clipping the "Box Top" logo from boxes of cereal, cake mixes, kleenex boxes, etc. the HSA earns money. The more you clip the more our school earns! Plus, fun prizes are awarded for all grades! Bring in your neatly trimmed Box Tops to your homeroom class. For more information go www.boxtops4education.com. Family, friends and co-workers love saving with the KidStuff Coupon Savings Book. It's loaded with family-friendly coupons for all ages and is only sold through participating schools. Our school earns $$ and your family saves $$! Opening a Savings account for your child is a great way to teach them about finances. Through our alliance with Boiling Springs Savings Bank, the HSA can earn money. When you open a checking or savings account tell them about us and they will donate money to our HSA quarterly. Click here for more details.